JCPenney is encouraging men to purchase jewelry with an integrated advertising campaign, “Beware of the Doghouse”. The “Doghouse” metaphor of banishment has been explored on film and online in a way that helps men discover that while their well meaning gifts and comments may be misunderstood, gifts of jewelry will always please. The commercial at the centre of the campaign features a man who has made the mistake of buying his wife a vacuum cleaner for their wedding anniversary. It doesn’t matter that it is dual beg. He’s banished to the doghouse. Sharing his exile are a group of men who, like him, have not been able to understand a woman’s appreciation of jewelry. They’re relegated to folding washing, quiche and chai lattes until they get it. The campaign is online at bewareofthedoghouse.com, where women can either send their man a warning or put him straight in the Doghouse. Users have the option of connecting up with their Facebook contacts list. Visitors to the site are shown three diamond gifts: the three-stone ring, the journey pendant, and diamond studs. Listen out for the spoken advice echoing through the doghouse. 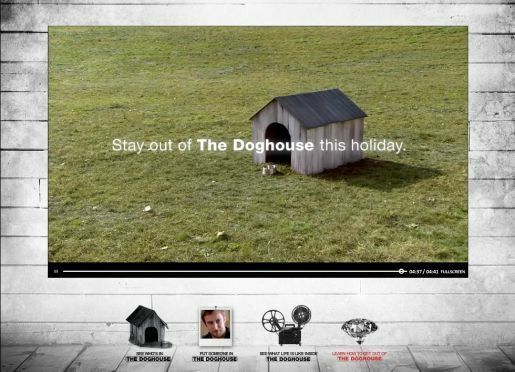 The Doghouse campaign was developed at Saatchi & Saatchi New York by chief creative officer Gerry Graf, executive creative director Amie Valentine, creative director/copywriter Josh Rubin, creative director/art director Jason Musante, senior agency producer John Doris, head of digital production John Swartz, integrated producer Kwame Taylor-Hayford. Filming was shot by director Bryan Buckley via Hungry Man with producer Mino Jarjoura. Visual effects were produced at Big Sky Editorial by editor Chris Franklin and VFX artist Ryan Sears. Sound was designed at Sound Lounge.